• Edward B. Bennett, 26, of 209 Early St. in Paradis, was arrested on March 1 and charged with attempted purse snatching and possession of SCH IV and Fugitive/ JPSO. • Jessica, Lewis A., 25, of 209 Early St. in Paradis was arrested on March 1 and charged with principal to purse snatching and Fugitive/ St. Tammany Parish. • Carl J. Evans, 28, of 320 Second St. in St Rose, was arrested on March 26, and charged with two counts of forgery. • Dale J Estay, 59, of 228 Scott St. in Paradis, was arrested on March 29, and charged with possession of marijuana and possession with intent-drug paraphernalia. • Kellie Savage, 46, of 15244 Highway 90 in Paradis, was arrested on March 29, and charged with possession of marijuana and possession and distribution of a legend drug. 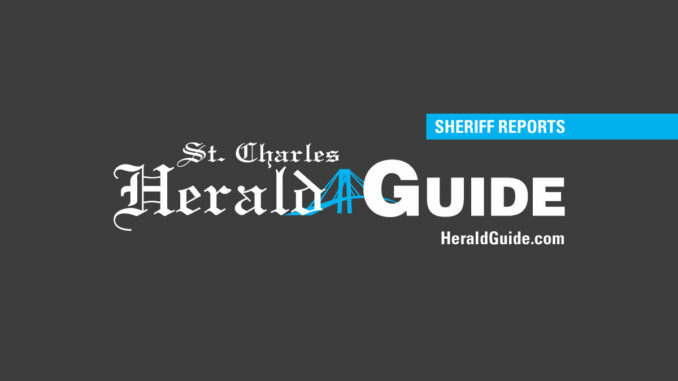 • Sean D. Thibodeaux, 22, of 185 Rue Landry in St. Rose, was arrested on March 28, and charged with possession of marijuana, possession of drug paraphernalia and possession of a SCH-III drug. • Branum J. Tanner, 21, of 505 Terre Haute Place in Houma, was arrested on March 27, and charged with possession of marijuana, possession of a sch-IV drug, possession of drug paraphernalia and reckless operation. • Fredrick Boudreaux IV, 26, of 13027 Sevres St. in New Orleans, was arrested on March 31, and charged possession with intent SCH-I, marijuana possession of drug paraphernalia, use of a firearm with a CDS and violation of a protective order, fugitive/NOPD. • Theresa Baker, 38, of 2230 Felicity Street in New Orleans, was arrested on March 31, and charged with possession with intent of SCH-II, cocaine, possession with intent, marijuana, false certificate, no liability insurance and improper parking on a shoulder. • Byron J. Friloux, 25, of 520 Woodside Dr. in Houma, was arrested on March 29, on I-310 NB and charged with DWI Reckless Operation. • Alex Rivera –Hernandez, 30, of 4523 Temple St. in Metairie, was arrested on March 28 on U.S. 61 and charged with DWI and obstructing public passages. • Charles E. Roques, 54, 5855 Walnut Creek Road in River Ridge, was arrested on April 5, on Hwy 90 and charged with DWI and improper control of a motor vehicle. • Elizabeth C. Robert, 55, of 5 Richelle St. in Waggaman, was arrested on April 3, on Hwy 90 and charged with DWI, speeding and expired driver license. • Stephanie D. Madere, 29, of 539 Alleman St. in St. Rose, was arrested April 4, on St. Charles Blvd and La. 18, and charged with DWI, hit and run, reckless operation, operating a vehicle with a suspended license. • Bonnie L. Lewis, 41, of 516 Steve St. in St. Rose, was arrested on April 4 on Peter Ln. and charged with DWI, speeding, failure to obey policeman registration certificate. • Joradae J. Grows, 32, of 164 East 6th St. in Edgard, was arrested on April 3, on La. 3127, and charged with DWI (child endangerment) reckless operation, open container, child restraint required, expired driver’s license and failure to return leased vehicle, FUG. • Robin L. Johnson, 29, of 6119 Villa Ashley Dr. in Baton Rouge, was arrested on April 3 I-310 off ramp and charged with DWI, obscenity, urinating in public, open container, improper parking on shoulder, driver’s license not on person, display of plate. • Levi Brown, 50, of 2330 Cambronne St. in New Orleans, was arrested on April 3, on I-10 West and charged with DWI and open container. • Vanessa A. Roussel, 57, of 304 St. Rose Ave. in St. Rose, was arrested on April 3, on Airline Hwy and charged with DWI and reckless operation of a motor vehicle. • Manuel J. Thibodaux Sr., 62, of 1039 W. Railroad Ave. in Independence was arrested on April 2, on I-10 and charged with DWI, hit and run, improper control of a vehicle, obey police/traffic signal. • An Interstate battery and pad lock were stolen from 900 Riverbend Drive in St. Rose on March 26. • A 10-ft. Pirogue was stolen from 241 Villere Dr. in Destrehan on March 28. • Four large truck tires with rims were stolen from 141 Crooked R Lane, in Ama on March 28. • An X-box 360 and 60” Plasma TV, and assorted U.S. currency was stolen from 122 First St. in Boutte on March 27. • A Weed Eater and a leaf blower were stolen from 13786 River Road in Destrehan on March 31. • A handgun, flashlight and U.S. currency were stolen out of a vehicle from 426 Magnolia Ridge Road in Boutte on March 31. • A washing machine was stolen from 700 Early St. in Paradis, on March 28. • Three galvanized fence post were stolen from 714 St. Rose Ave. in St. Rose. • A deep sea fishing reel, a GPS and a radar detector were stolen out of a vehicle from 11842 River Road in St. Rose. • Assorted jewelry was stolen from 309 St. Nicholas St. in Luling on April 5. • A golf club set with a golf bag was stolen from 2353 Ormond Blvd. in Destrehan on April 5. • A 2006 Freightliner Truck was stolen from 10326 Airline Hwy in St. Rose on April 2. • Assorted fishing equipment and a wallet containing assorted credit cards were stolen out of a boat from 601 Fifth St. in Norco on April 3. • A 10” subwoofer and a subwoofer box were stolen out of a vehicle at 310 East James St. in St. Rose on April 3. • A .38 Special chrome 5 shot and five hollow point bullets were stolen from 13491 Hwy. 90 on April 3. • A lawn mower,a weed eater, a blower and a three-gallon boat gas tank and assorted rods and reels were stolen from 302 Pioneer Dr. in Hahnville on April 5.